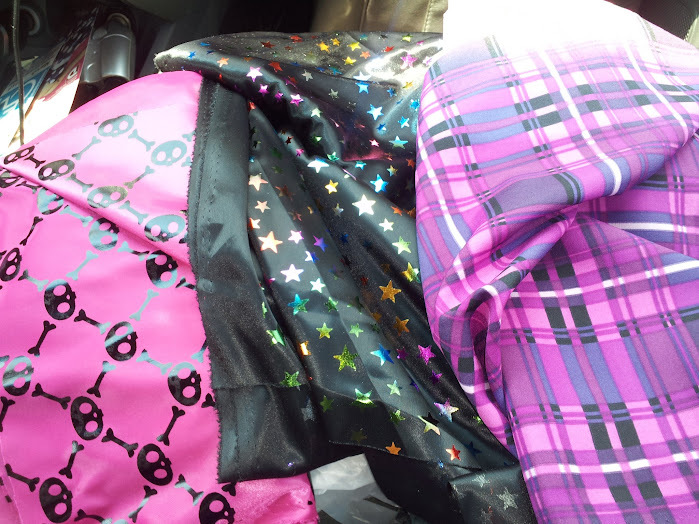 Right around the time of Youth Celebration, I found three really awesome fabrics on the red tag table of JoAnne’s. Even better, the red tag fabric was at 50% off. Awesome fabric for $2 a yard? WIN! I picked up several yards of each of these! Great, right? No I’m not sure what I’m going to do with the skulls or the stars, but I’m thinking I need more skirts for October (and the rest of the year). If you have thoughts, feel free to hit me up in the comments. The fabric is very slick/filmy so it must be “floaty”. Why? Because, that’s how I roll. Let’s get started with how I made the skirt! Step 1: I spread the plaid fabric out with the mind to make a full circle skirt. The fabric measured 60 inches wide, which means you can cut your skirt like a donut for no side seams. Perfect for a plain – you don’t need to try to match plaid patterns at the seam! If you choose this, make sure you plan for an elastic waistband and make the opening match your hips, not your waist! In order to cute a donut, you need to double fold the fabric. Fold it once lengthwise and then once widthwise. I laid out my full circle skirt pattern from the second skull skirt. See how the edges almost perfectly meet the two folds? Step 2: I grabbed my handy-dandy sewing scissors and badda bing, badda boom, one circle skirt. I think it’s pretty awesome that I could actually cut it in one fell swoop without the need of a seam. Now your choice is, open up a side, or you’re going to pull this bad boy over your head if that inner circle measurement matched your waist. Love it!! Can’t wait to see it in person! !